Eggs are great, but adding veggies and seafood makes them irresistible. After you’ve had weight loss surgery, this crustless quiche is perfect for breakfast, brunch, or a light dinner. Have the kids mix all the ingredients and pour it into a prepared casserole pan. While the quiche is baking, start preparing your fresh fruit salad and set the table for a family meal. Preheat the oven to 350 degrees F. Spray an 8-x-8 baking dish with nonstick cooking spray. In a medium mixing bowl, combine eggs, sour cream, ricotta, Parmesan, onion powder, and nutmeg and whisk for 2 minutes or until smooth. In a small mixing bowl, combine jack cheese, crab, shrimp, mushrooms, green onions, and lemon juice and mix well. Spread seafood mixture evenly into the baking dish. Pour the egg mixture over the seafood mixture. Place the dish in the oven and bake for 30 minutes, or until a knife inserted in center comes out clean. Let stand 5 minutes before serving. Per Serving:Calories 273 (From Fat 128); Fat 14g (Saturated 8g); Cholesterol 234mg; Sodium 418mg; Carbohydrate 9g (Dietary Fiber 0g); Protein 25g; Sugar 4g. Shredded cooked chicken can be substituted for seafood. 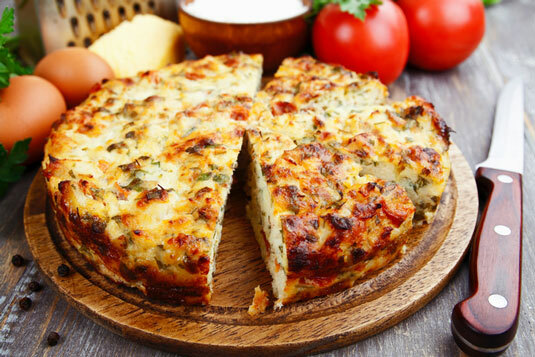 Though egg substitute can be used in many recipes, it’s not a good option here because egg yolks are needed to bind the quiche. White eggs or brown? It doesn’t matter! Eggshell color has nothing to do with the nutritional value, flavor, or cooking of the egg. The color of the shell comes from the breed of chicken laying the egg. White-feathered chickens with white ear lobes lay white-shelled eggs, and hens with red feathers and red ear lobes lay brown eggs.